Last night at dinner Greg asked me what I planned to share here at Bob Vivant in my next blog post. “Those smoky almonds that you fell hard for this weekend,” I answered, hoping my tone masked the “duh” that I was thinking. “Oh, I’m feeling called to write about our trip to Punxsutawney,” I replied. The notion of a call to write needs no explanation for Greg, but I could tell from his face that the subject surprised him. “Didn’t you already write about our trip?” he asked. Greg was right. Most people don’t take the whole weather-predicting groundhog business as seriously as I do. The poor folks in the East who are still digging out from the weekend’s snow storm probably aren’t thinking much about Phil and his promise for an early spring, and if they are, it’s doubtful that they are thinking pleasant thoughts. Ten days after our first-ever hike to Gobbler’s Knob, the magic of our trip lingers in a surprising, though pleasing way, like the smell of a good curry that wafts out the door to greet you three days after you served it for dinner. Rising at 4AM to stand in the bitter cold with thousands of strangers, many of whom are decked out in hand-stitched brown wool hats made to look like groundhogs, isn’t what most people would call a desirable equation for finding magic. Now consider this, you’re standing so close to a brilliant fireworks display that it feels like the exploding colors are raining down on you. Then as the fireworks end you watch the sky lighten with the rising sun. The estimated crowd of 30,000 people begin chanting, “Phil, Phil, Phil.” And a few tipsy onlookers scream, “show us the hog.” This enthusiasm is infectious. You’re no longer a bystander; you’re a part of this pulsating, merry mob. After an eight-hour drive from Chicago and four hours of restless sleep at a Motel 8, there I was on Gobbler’s Knob, my own voice ringing out in the joyful cacophony. Would Phil, the World’s only prognosticating groundhog, see his shadow, indicating six more weeks of winter? If he didn’t see his shadow, everyone who’d gathered at the Knob in their groundhog finery would be promised an early spring, something that in 127 Groundhog Days had only happened fifteen times. There’s a big stage with a stump in the center where Phil will soon make his appearance. People on the stage are singing and dancing, some of it’s good, some of it’s not great, but it’s all entertaining and more entertainment than I’m used to at 6:30AM. At last, it’s time for Phil to make his prediction. At nearly half-past seven Punxsutawney Phil, “the seer of seers, the prognosticator of prognosticators,” saw no shadow and declared an early Spring. The crowd erupted in deafening cheers. The sea of people I’d so recently considered strangers, now felt like friends. They hugged each other tight while bouncing in circles as though their team had just won the Superbowl. I turned to see my own groundhog-hat-wearing husband jumping up and down, spouting, “early spring, early spring.” In a word, it was unforgettable. If you go to Punxsutawney next year that is what you will likely find, shadow or no shadow. I began to realize that the devoted crowd that had hiked to Gobbler’s Knob that morning, enduring a sub-zero wind chill factor weren’t tied to the outcome; they were tied to the tradition. Then I thought about the man who wrote the movie Groundhog Day, Danny Rubin, who was an honoree at the Groundhog Banquet we attended on the previous night along with four hundred other guests. Some people believe that writing can’t change the world, but I’m convinced that it can change, or in the case of Punxsutawney, save a town. As a kid growing up in another small Pennsylvania town a hundred miles west of Punxsutawney, I’d huddle in bed listening to the live coverage of Phil’s annual prediction. We never drove to Punxsutawney for Groundhog Day or any day for that matter. My parents weren’t the traveling sorts. But if we had, we wouldn’t have found a crowd of 30,000 people, or even 3,000. In the 80s Punxsutawney was a mere shadow of the thriving coal-producing town it had been in the early 20th century. As the steel industry in Pittsburgh collapsed, so too did the economies of small towns, like Punxsutawney, that relied so heavily on that industry. Would the tradition have survived if not for the movie? Probably. Would the town of Punxsutawney have survived? Maybe, but we’ll never really know, because today the movie that helped save a tradition and a town has become a part of that tradition. If you would like to experience the magic for yourself, make the trek to Gobbler’s Knob next year. You may also want to bring along these sriracha almonds to snack on while watching the morning fireworks and waiting for Phil. Melt butter in a large skillet. Add salt, paprika, and sriracha sauce. Sauté for one minute, until fragrant. 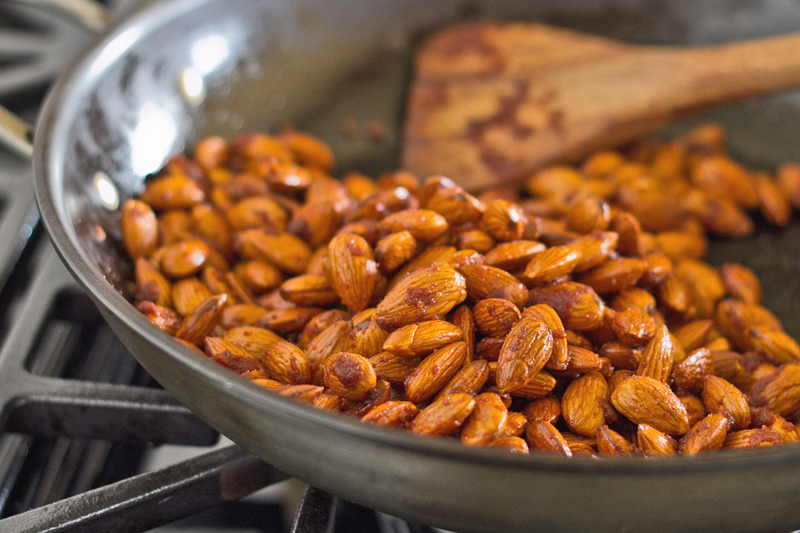 Add almonds, stir until they’re shiny. Pour almonds onto a large baking sheet. Bake for 7 minutes. Gently shake pan to redistribute the nuts. Return almonds to oven and bake for five more minutes. Let cool completely on the pan. Store in an airtight container. Please let Greg know that he is wrong. People have not forgotten that Groundhog Day was 2 weeks ago. I, for one, have been waiting anxiously to see how the trip turned out. Sounds like such a blast. What energy from that crowd! I would like to see a photo of you guys in your Groundhog hats please! Oh,and those almonds may just replace my favourite Prosecco snack of spiced pecans!! I guess we gotta see with our own eyes!